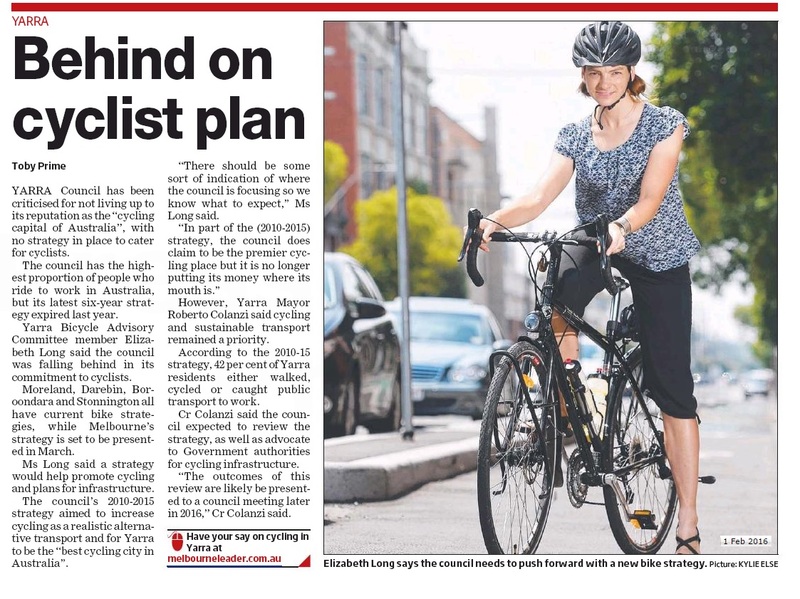 Yarra is Australia's cycling capital, Liz asks in this weeks Melbourne Leader why doesn't Yarra Council do more support it's own bicycle strategy & legacy? Does this issue go far beyond being simply financial and the recent council rate caps in Victoria? Yarra Council has been criticised for not living up to its reputation as the “cycling capital of Australia”, with no strategy in place to cater for cyclists. The council has the highest proportion of people who ride to work in Australia, but its latest six-year strategy expired last year. Yarra Bicycle Advisory Committee member Elizabeth Long said the council was falling behind in its commitment to cyclists. Moreland, Darebin, Boroondara and Stonnington all have current bike strategies, while Melbourne’s strategy is set to be presented in March. Ms Long said a strategy would help promote cycling and plans for infrastructure. The council’s 2010-2015 strategy aimed to increase cycling as a realistic alternative transport and for Yarra to be the “best cycling city in Australia”. “There should be some sort of indication of where the council is focusing so we know what to expect,” Ms Long said. However, Yarra Mayor Roberto Colanzi said cycling and sustainable transport remained a priority. According to the 2010-15 strategy, 42 per cent of people living in Yarra either walked, ­cycled or caught public transport to work. Cr Colanzi said the council expected to review the strategy, as well as advocate to Government authorities for cycling infrastructure. “The outcomes of this ­review are likely be presented to a council meeting later in 2016,” Cr Colanzi said.